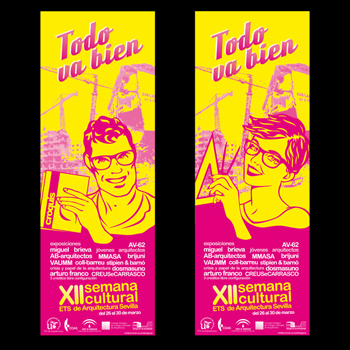 bRijUNi architects was invited by the ETSA Seville students association to give a lecture as part of the “Semana Cultural 2012” (Cultural Week 2012) within the common frame titled “Todo va bien” (Everything is ok). Our lecture took place on 27th March 2012 and we called it “Días de hedonismo y cítricos” (Days of hedonism and citrus). Other participants were AB-arquitectos, Arturo Franco, AV-62, Coll-Barreu, CREUSeCARRASCO, Dosmasuno, MMASA, Stepienybarno and VAUMM.